Neither of us had ever seen a machine like this before but we assumed it was a perm machine. 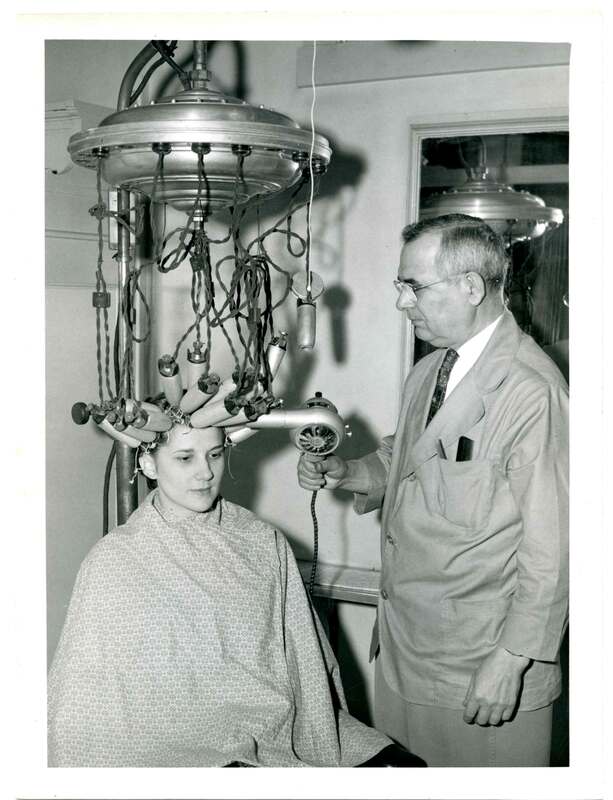 After a quick and dirty google image search I found that this was indeed an image of an antique perm machine. So what do you think? I personally would not let that machine within ten feet of my hair. Welcome to the Archives and Research Center of the Historical Society of Frederick County. April 13, 2015 May 8, 2015 mcurrenshsfc ARC Collections, Introductions	Byerly Studio, Citizens' National Bank, copy photograph, Frederick Civinette Club, Fredericktowne Players, Margaret Storm Culler Moore, Margaret Storm Moore, Mayor Lloyd Culler, Patsy Moore, photography, William Moore Jr.
Hello World! Let me start by introducing myself. My name is Marian and I am the Archives and Research Center Coordinator for the Historical Society. I am in my last semester at the University of Maryland’s iSchool, and will be graduating in May with my MLS, or Masters of Library Science. I am a lifelong resident of Frederick County and I am very pleased to be with the Historical Society, working to preserve and share Frederick County history. I have been with the Historical Society for about six months now, and every day I go to work I learn new things about the collections in my care. I make “discoveries” each time I search the catalog, finding new (to me) and exciting collections that show me the depth of what the Historical Society has to offer. Last week my favorite find was the photograph collection of Margaret (Patsy) Storm Moore. There is no finding aid for Patsy’s collection but I would like to create one. I have just begun to research Patsy to put together a short biography. 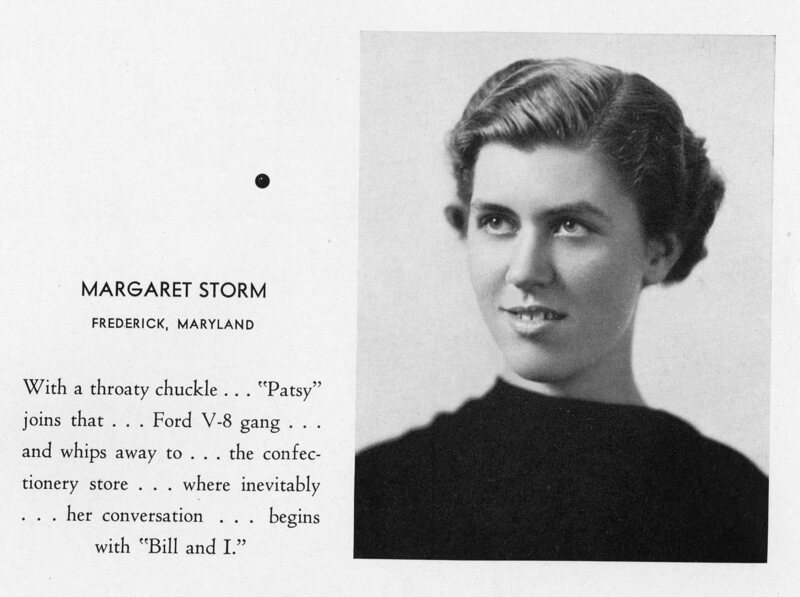 Margaret “Patsy” Culler Storm Moore, as she was named in her obituary (Courtesy of the Linton-Holdcraft Obituary Collection, of the Maryland Room of the C. Burr Artz Public Library) was born April 20, 1918 in Frederick. She was the daughter of William Bartgis Storm and Lillian Margaret Culler and the granddaughter of former Mayor Lloyd Culler. The year 1938 was a big one for Patsy; she graduated from Hood College and also married her husband, William Mack Moore. They had their only son, William Moore Jr. in 1939. Image from Hood College’s 1938 Touchstone Yearbook, courtesy of the Hood College Archives. Patsy worked in several Frederick businesses including Storm & Shipley’s, a stationery store, Martha Washington Candies, and Sharpe’s Florists. She volunteered as an air raid warden and a plane spotter during World War II. She was also active in the Fredericktowne Players, the Frederick County Hood Club, and in the founding of Bell and History Day, an annual event held each spring that celebrates the start of museum season in Frederick. Patsy was also active in the Frederick Civinette Club. At various times Moore served as President, Vice President, Secretary, and Program Chair. At anniversary dinners and other Civinette gatherings, she was often recognized for lending her photographic skills to the club. Frequently her photos of Civinette programs would be contributed to the Frederick News Post. Moore’s interest in photography led her to enter the photograph competitions held at the Frederick Fair. From what I have seen in the Frederick News Post, it appears Patsy often enrolled in several categories at the Fair and usually ended up placing in the top three, if not taking first. Patsy’s son William donated 196 of her photos to the Historical Society of Frederick County in 2002, two years before she died on October 16, 2004. William himself, passed away recently on February 25, 2015. Many photographs in the collection at the Historical Society are not original images but copy photographs which Patsy then dry mounted on board, but they are beautiful images none the less. The majority show the built environment of Frederick City and County. This image, for instance, was made by the Byerly Studio, in Frederick. The Byerly Studio operated in Frederick from 1842 into the 20th Century. P2004.02 Political rally in 1888 for Benjamin Harrison during his campaign for President of the United States. Original photo credit to Byerly Studio. This photograph features a political rally in 1888 that was held for Benjamin Harrison during his campaign for President of the United States. 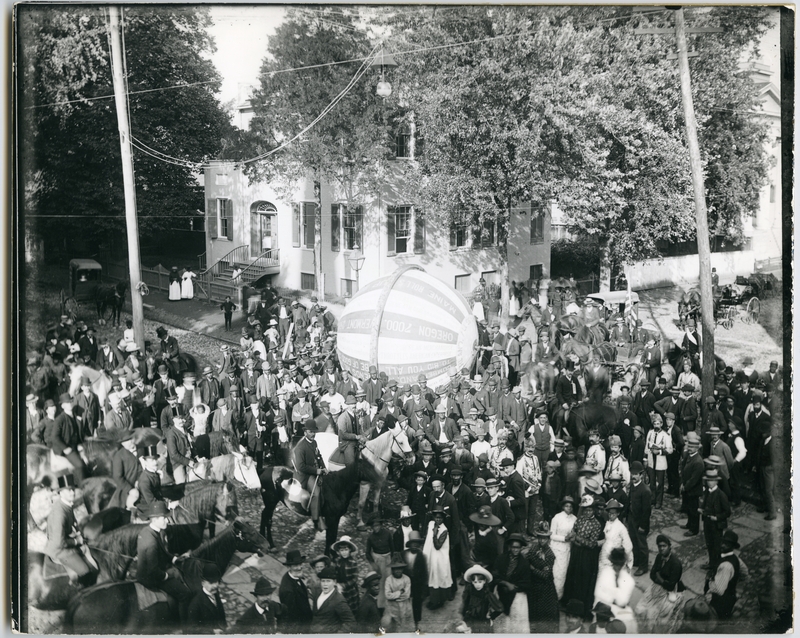 The large ball was rolled across country, through Frederick, and was meant to represent the large number of votes Harrison would receive over Grover Cleveland. The image shows the corner of Church and Court Streets. 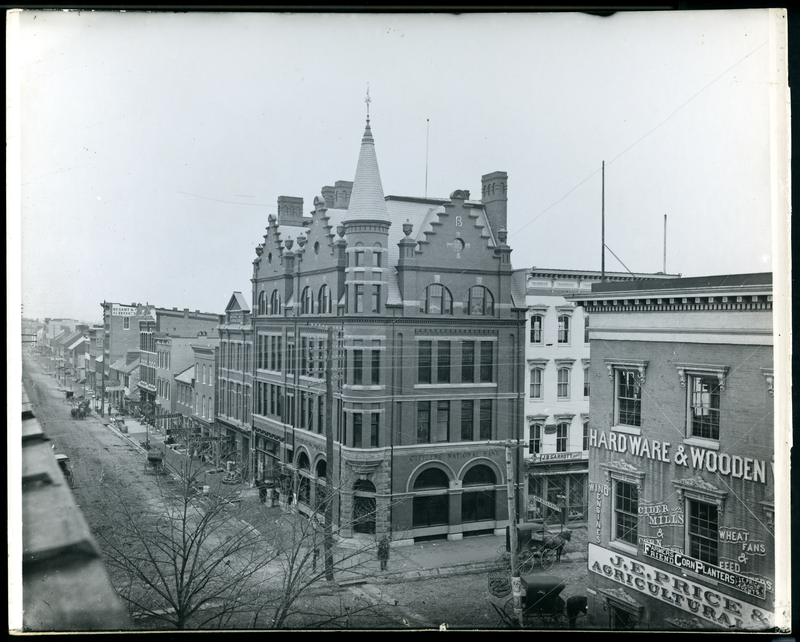 Below is another image from the photo collection created by Patsy Moore which shows Citizens’ National Bank on the southeast corner of Market and Patrick Streets. My research into Patsy has only just begun. If readers have stories or knowledge of Patsy’s life, or her interest in photography, we at the Historical Society would be delighted to hear from you. I would like to extend special thanks to Mary Mannix and Carolyn Magura of the Maryland Room of the Frederick County Public Libraries system, and Mary Atwell of the Hood College Archives for assisting me in my research.